By getting your car detailed, you can be sure that your car weathers through the years with ease. Whether you get an auto detailing done on a quarterly basis or on an annual basis, your car will benefit from the extra care you give to it through car detailing. Our car detailing shop in Campbelltown is accessible to nearby Sydney suburbs and the Mittagong area including suburbs Narellan, Bowral, and Gregory Hills. To suit every need, we offer several car detailing plans that include car polishing, tyre shine, vacuuming, engine wash and more. Visit Splash N Shine Car Detailing Centre in Campbelltown. Car detailing is a service that focuses on protecting, cleaning and maintaining the finer details of your car such as the rims, seats, wheels, and other parts that a regular car wash often misses. A car wash can usually take 15 to 30 minutes while car detailing can take hours. Auto detailing services can ensure that your car not only stays in good shape, but also looks as good as new each time it comes back from the car wash shop. The aim of a car detailing is to restore your vehicle to make it look brand new. For car detailing add-ons, please read our car wash and auto detailing plans and prices. It is important to get your car detailed since the interior of your car accumulates dirt and dust each day. Most experts recommend to get an interior car detailing done every 4 to 6 months or about 2 to 3 times per year. Auto detailing addresses your vehicle’s need for protection from harmful elements. Detailing the interior will depend on the type and use of your car. Even for conscientious car owners, your car seats, dashboards, floors, and ceilings may not be as appealing as when you first bought the car. Book a wash and detail today at Splash N Shine in Campbelltown. We have a variety of car detailing packages to suit every vehicle’s needs. Before sending your car off to get detailing work done on it, be sure to get it checked in order to notice the areas that need work and should get special attention. Make a point of letting the team working on your car know this too. It is possible that they might accidentally overlook certain factors. When getting detailing done, the best option is to evaluate the overall result of the paint job of your car. In this case, be sure to look at your car thoroughly from all angles. The pain should also be free of any watermarks, wax stains and more. At the end of the day, you want your car to shine and all the details on it to be visible. Once your car is back, you have to take the time to evaluate how the car detailing went. You have to take your time to look for car imperfections and whether they were successfully dealt with or not. This counts for the interior of your car. If your car interior is beginning to show wear and tear, you can easily get it repaired or replaced to look as good as the first time you sat on it. When you’re getting your car back, pay attention to the car wheels as well. The tyres should be washed, have good balance and the rims should also have been polished. Keep in mind that if the package did not contain these offerings, they might not have been given much attention. Where should you get your car detailed? Looking for a reliable car detailing service in Campbelltown or nearby Sydney suburbs? Go to your nearby car wash centre for any auto detailing services. Contact Splash N Shine Car Wash on (02) 4620 6238. Better yet, come to Splash N Shine Auto Detailing Centre in Campbelltown. 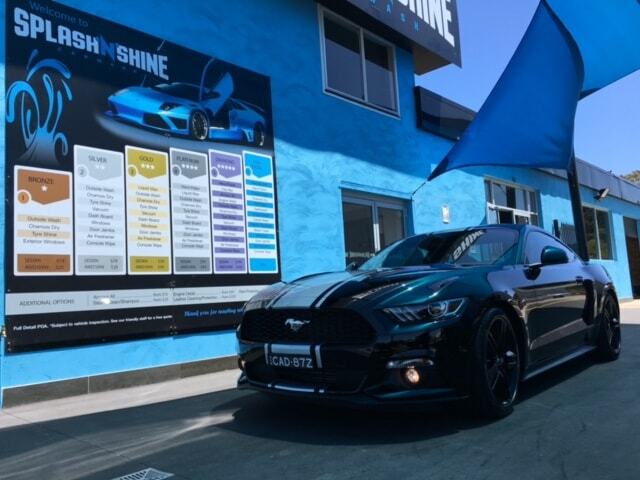 We are the trusted car wash and detailing experts who get the job done right.